WordPress has always been praised as one of the most SEO friendly and optimized content management systems (CMS) out there – even right out-of-the-box! But there are still some very important and basic first steps you will want to take upon first installing WordPress on your blog or site to help optimize the on-page SEO of your installation and ensure that you are on the correct path for raking well in search engines. As well all know high rankings = traffic and well, traffic = money. This post is for those whom have just installed WordPress and want to optimize their site to make sure they won’t have to go through tons of work later to fix up their basic on-page SEO. This is a very basic step but VERY important. WordPress has this little option under Settings –> Privacy where you can set your site to “block search engines”. Some hosts that have auto-install features may install WordPress with this setting on by default which will prevent you from being indexed in any search engine. Make sure to check that the setting is set to the option that says: “Allow search engines to index this site.”. For SEO and user-friendliness reasons you should always have a URL structure made up of keywords that tell you something about a page just by looking at it. Thankfully, WordPress has a “permalink” settings page which lets you change the URL structure to something more SEO optimized. 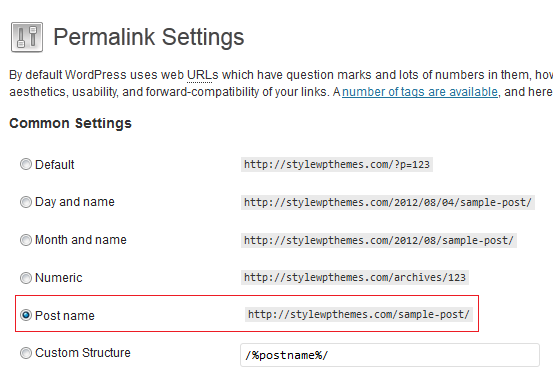 So head over to Settings –>Permalinks and choose the option that says “Post Name” or enter your own custom URL structure below. Note: For most people WordPress will update your .htaccess file automatically to reflect your new permalink structure, but for some you might have to update it manually. You’ll know because you’ll get a little warning also you’ll get 404 errors on your site. 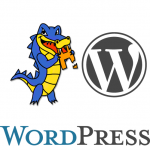 One of the best things about WordPress is the ability to install plugins that will add additional function to your site. When it comes to SEO, there are tons of WordPress plugins to choose from, many of which can be very useful in improving your site’s overall On-Page SEO. First you want to get an SEO plugin that will allow you to easily add meta descriptions and meta titles to your blog posts. I’ve tried several out there and my favorite plugins for this are the All In One SEO Pack” and “WordPress SEO By Yoast“. Personally, I use the All In One SEO Pack because I have already been using it for a long time and it would be very work intensive to switch over to the plugin by Yoast. When choosing the main SEO plugin for your site make sure to test a few out and find the one you like best. Make sure you really like it because after you have a couple thousand posts on your blog you won’t want to switch plugins and have to go through all your posts to fix all the meta titles and descriptions. A sitemap is always a great idea. Basically it is a a list of all the links on your website that you would like indexed and you can upload it via your Google Webmasters so you can tell Google what content you have on your site and what they should be crawling and indexing. The Google XML Sitemap is my favorite plugin for creating sitemaps. It will automatically re-generate your sitemap every time to write a new post and it will let the Search Engines know that the sitemap has been updated. In my opinion the Automatic SEO Links is a must have plugin. 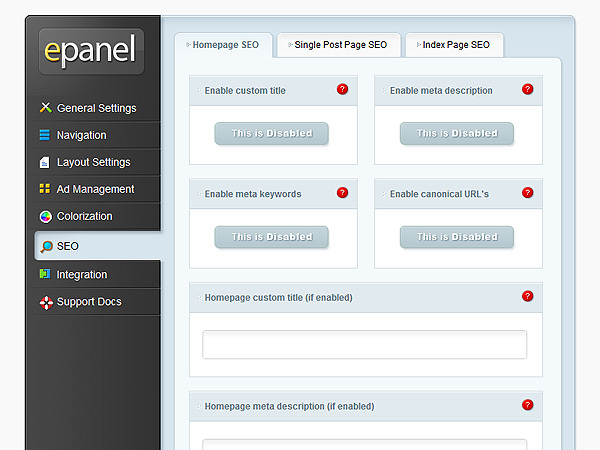 This plugin will allow you to enter keywords and choose a URL for each. The plugin will then automatically replace that keyword in your blog posts with a link to the matching URL. It is a very effective cross-linking technique that takes very little effort. The Automatic SEO Links can also be used for affiliates that want to promote products via keywords on your site. And yes, there is an option to add no-follow to any individual keyword link. Scibe SEO is a premium plugin that has gained a lot of popularity lately and is sure to be one of the best content and link-building plugins out there. The plugin was created by the very popular “CopyBlogger” and it works on a membership basis. Basically it adds a whole SEO analysis system to your site so whenever you are writing a new post it can scan it and give you all kinds of SEO tips for improving the blog post in terms of content, keywords, meta tags…etc. The plugin will also show you sources from which you could get related links to your posts as well as identify influential social media users that may want to share your content. 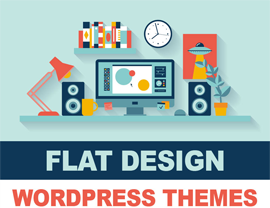 Choose a WordPress theme is also very important for SEO. A lot of free themes out there come with encrypted links that go to nasty gambling sites that will make you lose valuable page rank. Because these are sites that may not be related to yours, linking to them can hurt your rankings. Another issue is that some themes do not make proper use of heading tags (h1, h2, h3, h4..), content positioning (post text should always come before the sidebar) or are simply coded so poorly the search engine bots will have trouble crawling your site properly. Here are some things you will want to look for while choosing your WordPress theme. I personally do not like built-in SEO options in my WordPress themes. The main reason is because if I ever want to switch themes my On-Page SEO efforts are now all lost. So in my opinion it’s a really bad idea. However, for some people that really just want to setup a quick site maybe with just a few pages (like a quick affiliate landing page) built-in SEO options might be ok. Below is a quick look at the seo options that Nick adds to his themes over at Elegant Themes. You might want to check out my Elegant Themes Review and Elegantthemes Rating if you are interested in purchasing their bundle. It isn’t necessarily an SEO step, but setting up your tracking system right away will help you keep track of how many people are visiting your website as well as monitor how they got there. Keeping a close watch on your analytics can really help you optimize your site in the future. 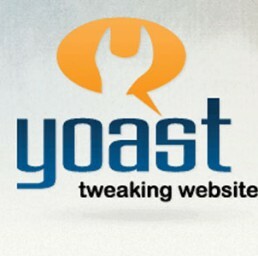 There are many plugins out there that will allow you to set up your tracking code on your site/blog (such as the Yoast Google Analytics Plugin). However many of the premium themes out there include an option in their admin panel where you can paste your code and it will automatically include your tracking in the header or footer of your site. Personally I would just open up my header.php or footer.php file and insert the code manually. We all know how important social influence is in terms of site rankings these days. And even if it doesn’t increase your rankings, it’s still important for generating traffic and followers. So you’ll definitely want to install some social bookmarking buttons on your site, such as the tweet button, google plus button and facebook like button as well as post links to your social profiles. Below are a few plugins I’ve used and liked. This is my favorite plugin for showing off your social profiles on your theme’s widgetized sidebar. 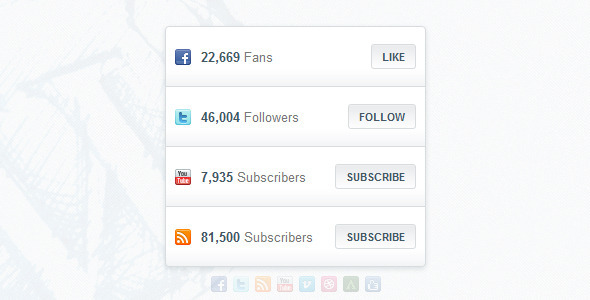 It not only allows you to showcase your links, but it also shows a counter of your followers. Plus, I’ve used it on StyleWPThemes in the past and it has worked great! 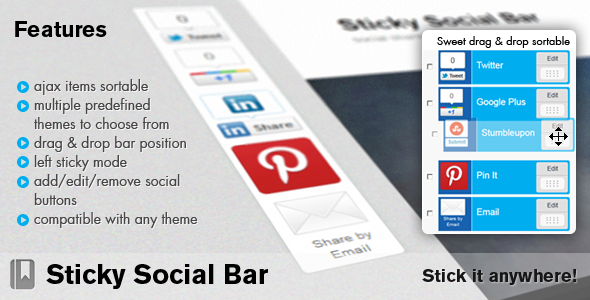 Sticky Bar is a really awesome WordPress Plugin that will add a static sharing bar to your website so users can easily click to like, tweet, or whatever your posts. It comes with some great options and since it adds a sticky bar, it will always be visible to your readers, making it more likely that they will click the buttons. Now that you are done setting up the basics, the only thing left for you to do is to write Epic content. Ultimately the biggest factor in whether you will get traffic and have people share your site is your content. You need to make sure your website provides value to its readers. And not only will having great content help you rank and make people share your site, but it will also help you gather a following. And for some websites your followers are what will generate the most income for you as opposed to passive visitors. If you get the basics done first and right, it will make your SEO work in the future an easier task. I’ve seen a lot of people that didn’t change their permalink structure until after they had hundreds of posts, which meant that they had to create a TON of redirects simply to flow their page rank to the new URL structure. Plus, if you get all the basic SEO out of the way right from the beginning you can focus on the more important stuff like content and social media.